Getting from the airport to your hotel can be daunting. How do I get there? How much will it cost? How far away is it? How do I get back to the airport? Now of course, depending on how many bags you travel with, where you’ll stay, and what your ultimate preference is for travel, this will affect your final decision. There are two airports in S. Korea; Incheon and Gimpo. Both airports are quite a distance away from the city of Seoul. 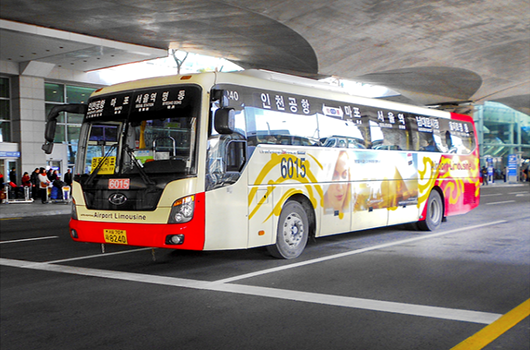 Incheon International is about an hour or more depending your mode of transportation and traffic. To be honest, I wouldn’t really recommend the all stop train. First off, you’ll have luggage to carry around. So how uncomfortable would that be if you hit rush hour and you have all your luggage taking up space let alone trying to haul that in and out of the subway. Secondly, the train stops at Seoul station, and depending on your hotel location you may have a lengthy walk ahead of you. The taxi would be ideal. Just maybe not ideal for your wallet. If you were arriving late at night and just want to get your hotel, this would be your option. My tip would be to ask what the rate would be to get to your destination. You don’t want to end up being surprised if you were charged more than you expected. The bus, for me anyways , was the best option. It was cheap, they handled your luggage, and it dropped me off at the corner of my hotel in Myeongdong. Now we’re not talking about a regular city bus….. this is an airport bus that specifically accommodates travelers and all of their luggage. One tip though, the bus does stop at various locations dropping off passengers or picking them up on the way to the airport (that’s why it takes a bit longer than a taxi). You can buy tickets for any bus you’re taking either inside the airport or outside the bus stops. If you feel lost, just find a help counter. That’s what I did, and it was nice that they had signs stating they spoke English. 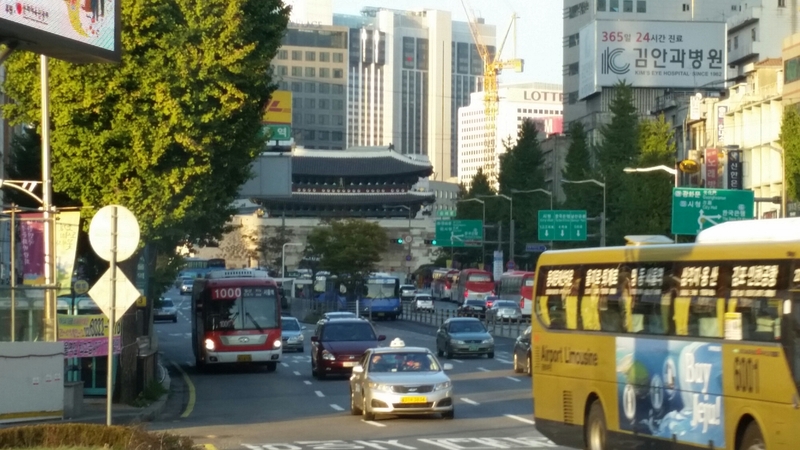 For all those staying in Myeongdong you can take bus # 6015 from Incheon airport and it drops you off on the main road right next to the alleyways of Myeongdong. The bus stop is just a few minutes walk from the Nine Tree Hotel or the Grand Hotel (located on the same side of the street). The Grand hotel is where I stayed, so once you get off the bus it’s fairly easy. Again, it’s just a few minutes walk. Once you are off the bus your back will be towards the road, go ahead and walk to your right, then take your first left into the alleyway, then you’ll be forced to make a left or right. For the Grand Hotel make your first right, and it will be up a small hill on your right hand side. If you see a 7-Eleven on your right hand side, then you’ve gone too far so go back!! If you’re staying at the Nine Tree Hotel, it’s all the same, except once you are forced to make a right or left, then you go left and walk a few minutes. 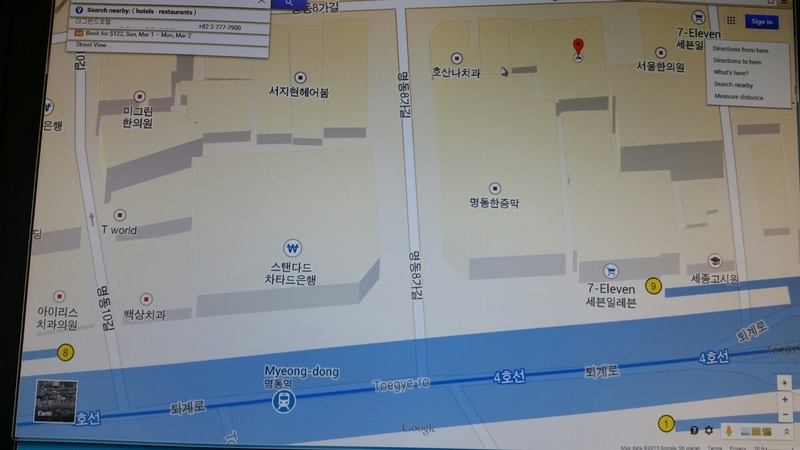 On this Google map below, you can see the bus icon on the main street, and the red dot indicates The Grand Hotel in Myeongdong. One tip from my personal experience; when returning to the airport via bus make sure you get there 15-20 minutes ahead of the scheduled departure. I had to take the earliest departure time at 4:50 am. I was thinking 10 minutes was early enough, but when I got to the bus stop everyone was already boarded!! I definitely had to pick up the pace to catch it. The bus ended up leaving right after I boarded. 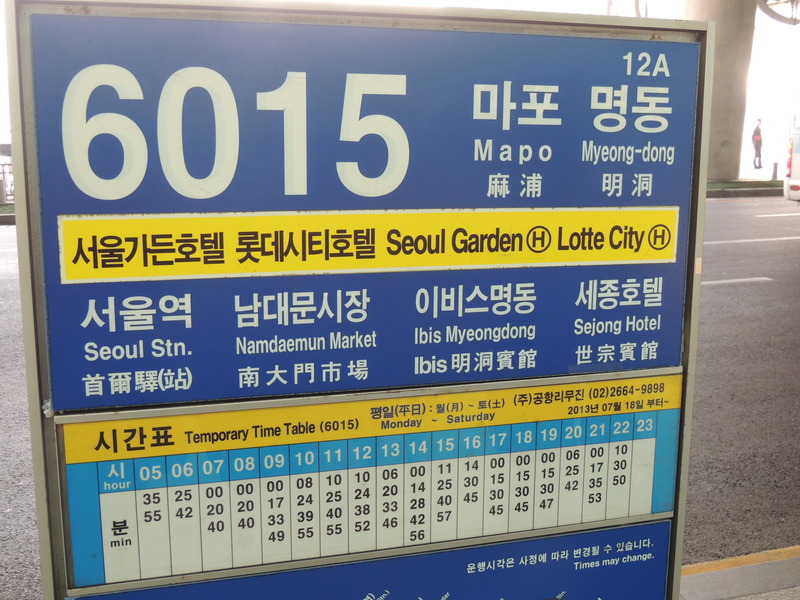 I hope this helps someone….anyone with how to get into Seoul from the airport. I’ve posted a link below that will take you to the airport’s bus information. This helped me tremendously. It lists all of the different routes, the location’s they stop at, and the frequency at which they operate. The transportation system may seem daunting, but trust me, it’s harder than it looks!